ToneTap "Professional Edition" is our professional-grade system intended for the rigorous demands of live performance, session playing, and home studio work. It uses our highest quality tracking algorithm and has excellent pitch and expression tracking. 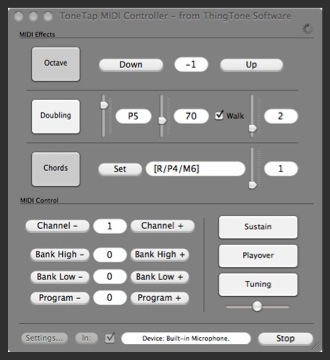 Shown here is the main ToneTap performance window with its built-in MIDI effects for octave, part doubling, and chording. 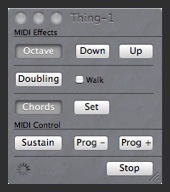 The MIDI control section enables channel and program change, MIDI sustain, playover, and pitch bend. All of these features can be controlled via a small wireless right-thumb remote control (sold separately) attached to your instrument. With remote control you can operate all of the buttons shown in the effects section as you play. Control octave up and down, sustain and release, two-part harmony, program change up and down, and even chording. Professional Edition also offers the ability to create, save, and load an unlimited number of presets. 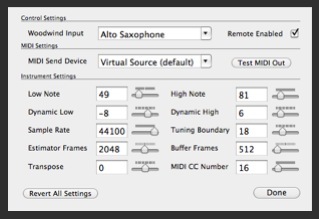 Included in the preset performance data are the detailed parameters used by the MIDI conversion engine, as shown here. These parameters can be tuned to bring out the particular dynamic response and playing sensitivity you desire, as well as doing transposition or continuous control mapping. This space-saver view can shrink ToneTap into the smallest possible screen area without compromising on usability. With this view you continue to have access to all of the essential features of ToneTap but allowing room for other windows that need to share the screen.